While I was on vacation I got the chance to eat at a Chinese restaurant and the chicken sweet corn soup on the menu caught my attention. There were just so many things that I wanted to try that I did not end up ordering the sweet corn soup but I figured that I could make it at home. With the end of corn season within sight it was time to try making a sweet corn soup and this weekend I got the chance to. I went with a very simple version of the soup with garlic, ginger, green onions and soy sauce for flavour in addition to the corn and chicken and I could not resist adding a bit of heat in the form of a birds eye chili. One thing that I really like about many Chinese soups is the egg drop which adds a really amazing texture to the soup and makes it a bit more filling. I also added a touch of corn flour to thicken the soup up a bit. (If you prefer an even thicker soup, feel free to add more corn flour.) One thing that I find is quintessential about Asian cuisine is that aroma of toasted sesame oil so I added a few drops to the soup to finish it off. 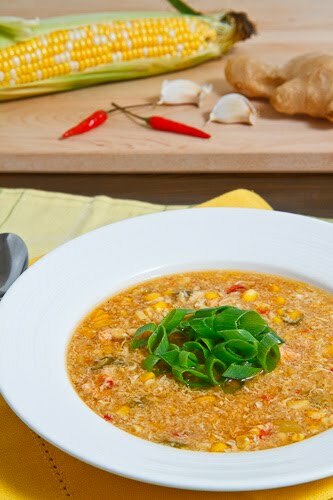 The sweetness of the corn plays really well with the salty soy sauce seasoning in this soup and it was a great way to enjoy some of the last of the fresh locally grown corn! Add the whites of the green onion, garlic, ginger and chili and saute until fragrant, about a minute. Add the stock, chicken, corn, flour, soy sauce and pepper, bring to a boil and simmer, covered, for 20 minutes. Fish out the chicken, shred it with a pair of forks and return it to the soup. Pour in the egg in a slow stream while stirring. Remove from heat, add the sesame oil and serve garnished with the greens of the green onions. Looks delicious. I can't wait to try it myself! Yes, corn flour or starch works well to thicken the soup. In my dad's restaurant they mix the corn flour with water first and then gently stir it in as the soup is sizzling. I have never mastered this method, but would love to give it a try. Hahaha! Maybe I'll do that when I try this recipe. BTW, on your vacation, did you stop by Richmond (near Vancouver) for the Chinese food? Richmond has quite some good Chinese restaurants. yummy! I can't wait to try this as well. I really enjoy your blog. The recipes are always explained so well and your photos are so beautiful…makes my mouth water. I just launched my blog today and coincidentally my first topic is how to make homemade chicken stock. thismommyloves.com Hopefully some of your readers might enjoy it! What a great idea! I love the photo with the corn cob in the background, too! This looks perfect for autumn. Thanks! I always love a good soup recipe..
A wonderful soup! Very pleasant. I've never heard of this being a typical Chinese dish…but it sounds delicious and I love that it uses seasonal veggies. Hi Kevin. I am Jelena, a fellow blogger from Belgrade. What a great blog you have. I have made your avgolemono Greek soup and it is waiting to be posted. Fantastic. This one has been bookmarked. I agree that sesame oil is irreplaceable. Gives it that special kick. Looking forward to your recipes! oh, I love that green top of this delicious soup, Kevin! This is one of my favourite soups and it is so easy to make. Great recipe. I had so much meat this weekend, that this will ring a welcome change!!! I love, love, love chicken corn soup! today is the perfect day for this soup and I am going to make it. thanks for the inspiration! This soup looks really good! I love chicken and corn together, especially with some heat! OMG! This is right up my alley! Soup Season . . . . come on!!!!! I'm a little scared of the whole "red pepper" thing. Can you be more specific? about what to use? I love anything with corn–this sounds so unique, but delicious no doubt! When I saw the title of this post, I was so not expecting a Chinese-inspired soup. Pleasant surprise! You've reminded this is a great soup to make. Yours looks so appetizing. I am subscribing to your fantastic blog. Truly amazed at all the variety of dishes you've made. Even more amazed you're still on Blogger. You've convinced me to just stay with it. Thanks for sharing your experiments. You cook with great intuition. LeAnn: I used a birds eye chili but feel free to substitute as desired. The Girlie Blog: I got to the Richmond night market and had some great food!